It seems impossible to read up on anything about curly hair without coming across information regarding hair typing. Honestly speaking, at first I couldn’t understand what the big deal was about naming each type of curl, I mean a curl is a curl right? But I realised the thinking behind this is based on the type of curl you have, it may help you to create your hair regime to suit your type of curl best. And if you’re looking for inspiration or styling tips from someone with similar hair as yours you can use this classification system as a reference. 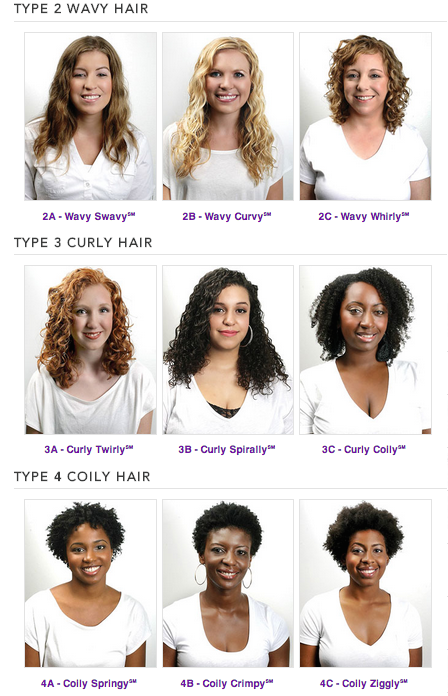 As handy as it may be, this system only looks at the hair’s curl pattern. It doesn’t take things like density or porosity into consideration. For the most part I’m still not sure where exactly I fit on this scale as I’ve definitely come across curls on my head that don’t really seem to fit in with this chart. And I don’t really see the need to try and box anyone else’s hair in a specific category either. A lot of naturally curly girls also have a few different curl patterns on their head (myself included) which further seems to confuse things. Having said that, for the purposes of this piece, I’m going to try and see where my strands fit in on this chart. So it’s because of this multiple texture scenario that I don’t place too much stock in this kind of hair typing, but I suppose it’s good to be armed with all the knowledge out there. There are numerous other ways to figure out your hair besides just looking at a curl pattern. These things include whether your individual hair strands are thick or thin, and how porous your hair is. These factors all play a part in how you care for your hair and I’ll touch on them in future posts. In the meantime though, you can read up more about the general characteristics of each of the curl patterns here. As always, love your curls. Do you consider hair typing and curl pattern in the care and maintenance of your hair?